Dharamsala, India -- The Central Tibetan Administration has mourned the demise of His Eminence Kyabje Trulshig Rinpoche, head of the Nyingma School of Tibetan Buddhism, describing his passing away as a loss to the Tibetan Buddhism. He passed away at the age of 88 on 2nd September 2011 at 8:30 am. "The Kalon Tripa is saddened by the demise of His Eminence Kyabje Trulshig Rinpoche and expresses his deep condolences" the kashag's statement said. The staff and officials of Central Tibetan Administration held a prayer service at 12.00 pm today, after which all the offices remained closed for the day as a gesture of homage. 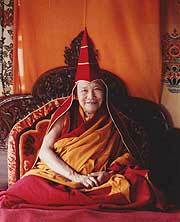 Kyabje Trulshig Rinpoche Ngawang Chokyi Lodoe, was born in Lho Talung, Tibet in 1923. He was recognized at the age of four, as the reincarnation of his own heart lama, Trulshig Tendru Dorje by abbot Ngawang Tenzing. His Eminence Kyabje Trulshig Rinpoche studied at Dza Rong Phu with Ngawang Tenzin and took novice vows at the age of 10. When he was 19, his beloved teacher died and following his wishes, Trulshig Rinpoche took his place as Khenpo (abbot) of Dza Rong Phu monsatery. Shortly after, he went to Mindroling college for further teachings. He took gelong vows from Chung Ngawang Chodar Rinpoche and Khyentse Norbu Rinpoche who were his two main teachers at Mindroling. He also studied with 34 different lamas including Mindroling Dechen Choenzing, learning many aspects of Buddhist scriptures and practice. In 1959, when His Holiness the Dalai Lama went into exile in India, Trulshig Rinpoche also fled south across the Himalayas into the Everest region of Nepal. He stayed at the monastery in Thame for one year, then moved to Chiwong monastery for 5 years. He later established a monastery at Sengye Puhk (the lion cave), above Thupten Choling on the lower slopes of Shyorung Yul Lha. Later, he and his followers established Thupten Choling monastery, now the largest monastery in Nepal with 150 monks and 350 nuns studying and meditating there. Kyabje Trulshik Rinpoche became the head of the Nyingma school of Tibetan Buddhism in 2010 and was one of the main teachers of His Holiness the 14th Dalai Lama as well as many other younger generations of Nyingma Lamas. Kyabje Trulshik Rinpoche was based in Solokhumbu, Nepal and was considered to be the spiritual heir to several Nyingma masters of the last century such as Dudjom Rinpoche and Dilgyo Khentse Rinpoche. The Tibetan Parliament in exile issued a condolence statement on Monday. "We are saddened by the passing away of His Eminence Kyabje Trulshig Rinpoche , who dedicated his whole life to the cause of Tibet," Tibetan Parliament in exile said in a statement.